The early results from today’s First District Special Election have been posted by the Orange County Registrar of Voters and former State Senator Lou Correa is in the lead by 149 votes. 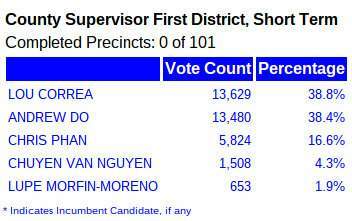 Former Supervisor Janet Nguyen’s henchman, Andrew Do, is in second place with 38.4% of the vote. Will Andrew Do and Janet Nguyen succeed in fooling GOP voters on 1/27? Will First District candidate Andrew Do and his former boss Janet Nguyen succeed in fooling Republican voters in the Jan. 27 Special Election? 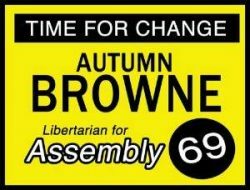 This Saturday & Sunday, please join our campaign team as we give a final push towards the finish line! This is the final weekend before the January 27th Special Election, and the weekend we need your help the most. When: Saturday (1/24) – 10:00 am to 6:00 pm. Sunday (1/25) – 10:00 am to 6:00 pm. Predictably Andrew Do blew off the First District candidates forum that was held in Santa Ana yesterday. Why would he want to put himself in a position to have to explain why he quit the Garden Grove City Council in 2011 or answer the questions about whether or not he actually lived in Garden Grove at that time? The rest of the candidates showed up including Lou Correa, Chuyen Van Nguyen, Chris Phan, Lupe Moreno and a write-in candidate, Mark I. Lopez. There are several local candidates running for the First District of the Orange County Board of Supervisors – and several of them are looking for volunteers to help them as the special election is coming up very quickly, on Jan. 27, 2015. If you would like to help former State Senator Lou Correa, a Democrat who lives in Santa Ana, contact Alex Flores at 714-474-8768 aflores18@gmail.com. If you are interested in helping Garden Grove Councilman Chris Phan, a Republican, contact George Brietigam at gbrietigam@gmail.com. If you want to help Andrew Do, a Republican who quit the Garden Grove City Council a few years ago, click here. Andrew Do appears to be the first candidate running for Orange County’s First Supervisorial District to get a campaign mailer out. The mailer is nothing special but it serves to establish that Do is backed by a bunch of mostly white Republican elected officials – and his former boss, Janet Nguyen. Notably he does not appear to be backed by any Latinos.